This blog began as my 366 Photo Project for 2012. Four years later, I want to take on the 366 Project again! Enjoy the world through my lens in 2016! Happy New Year! Today was his Board of Review and my son has earned Scout, Second Class. Very proud of him and how seriously he takes Boy Scouts. He is currently one of three Patrol Leaders in his Troop. He has earned the Geneology and Game Design Merit Badges so far this year. 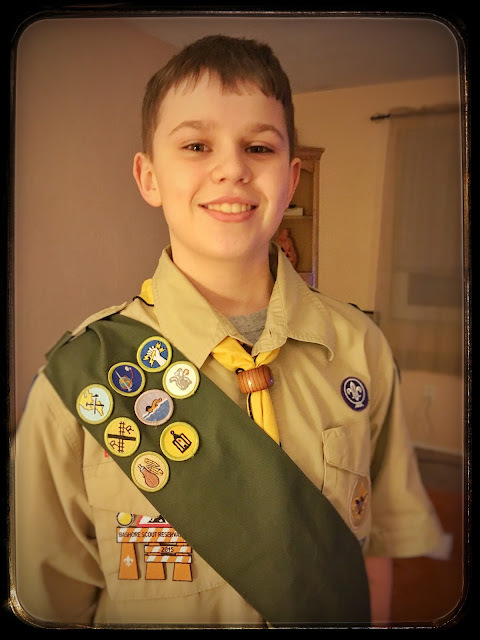 He is leading a group of scouts in his troop in the First Aid Merit Badge (Eagle required) with the help of an Assistant Scout Master/Merit Badge Counselor in their Troop and the Environmental Science and Oceanography Merit Badges are being worked one as well. Daniel hopes to be Scout, First Class by the Court of Honor in June and Eagle Scout is his ultimate goal and I know he will do it. I still remember the entire Boy Scout motto, I don't remember the serial number of my gun in the army. I don't remember the number of my locker in school. But I remember that Boy Scout Code. ©Samantha M. O'Brien 2012. Awesome Inc. theme. Theme images by molotovcoketail. Powered by Blogger.